As a member of a delegation documenting NATO war crimes in 1999, I visited Nish, the third largest city in Yugoslavia. NATO attacked this appealing old city on forty occasions, destroying approximately 120 buildings and damaging more than 3,400. On the night of our second stop in Nish, we attended a meeting with university professor Jovan Zlatich. During the NATO war, Dr. Zlatich served as commander of the city’s Civil Defense Headquarters. In his discussion of the bombardment of Nish, he focused particular attention on the use of cluster bombs. Nish had the misfortune of being the target of several CBU-87/B cluster bombs, a weapon designed to open at a predetermined height and release 202 bomblets. These smaller bombs burst in a furious repeating series of explosions, spraying thousands of pieces of shrapnel over a wide area. Cluster bombs are anti-personnel weapons. While causing relatively minor damage to structures, they inflict frightful damage on human beings. The starting speed of the explosive charge in a cluster bomb is more than three times that of a bullet fired from an automatic rifle. Consequently, as shrapnel strikes its victim, the combined kinetic energy and explosive power is capable of causing a wound up to thirty times the size of the fragment itself. Because the bomblets are dispersed, they can cover an area as large as three football fields with their deadly rain. We had the opportunity to visit these sites. On three separate occasions, we walked down Anete Andrejevich Street and talked with residents. It was on this street at shortly after 11:30 AM on May 7 that cluster bombs fell. At one end of Anete Andrejevich Street is a marketplace, and on the day of the bombing the area was busy with shoppers. The street was narrow, lined with buildings that were old and charming. Evidence of the attack was unmistakable. Almost every house was pockmarked, and shrapnel had gouged hundreds of holes in the walls of the more heavily damaged homes. There was no place for pedestrians to hide on that day. One parked car had not moved since the day of the bombing. It was still there, riddled with punctures and resting on flattened tires, its windows covered with plastic. Memorials to the victims were posted at the spots where they had been killed. Home on Anete Andrejevich Street, pockmarked by cluster bomb fragments. Photo: Gregory Elich. At the corner of Jelene Dimitrijevich and Shumatovachka Streets, a memorial for Ljiljana Spasich was posted on a brick wall at the place where she was killed while walking home from the market. Only 26 years-old and seven months pregnant, she was just one month away from completing her fifth and final year at medical school. She had planned her life well, expecting to give birth shortly after graduation. But NATO had other plans for her, and an exploding cluster bomb canister killed both her and her unborn baby. Memorial to Ljiljana Spasich, posted at the spot where she was killed. Photo: Gregory Elich. Two memorials to Pordani Seklich were posted on the front door window of the restaurant where she was employed as a waitress. She was in the kitchen when whizzing shrapnel tore through the roof and killed her where she stood. Our hotel, located across the Nishava, overlooked the neighborhood around Anete Andrejevich Street, and we had walked extensively throughout the area. It was an entirely residential neighborhood, with nothing that could be construed as a military target. Only ten minutes after the cluster bombing of the marketplace neighborhood, a NATO warplane dropped an incendiary cluster bomb on the parking lot of the Clinical Center. A ball of fire engulfed the parking lot, igniting cars and sending thick clouds of black smoke billowing into the sky. Several homes on the adjacent block were damaged. Shrapnel by the hundreds shot through the hospital, causing the roof over the classroom to collapse. It was the everyday routine for staff to meet in the classroom at noon to discuss the war while eating lunch. Had the attack come twenty minutes later, all would have perished. In one room alone, over ninety holes from bomb fragments were counted. Parking lot of Clinical Center, target of incendiary cluster bomb. Photo: Gregory Elich. The incendiary effect of the bomb brought to mind Djakovica, where NATO attacked a column of Albanian refugees who were returning to their homes in Kosovo. According to a wartime report in Jane’s Defence Weekly, the Pentagon was anxious to introduce the newly developed CBU-97 cluster bomb. This weapon was designed to spray shrapnel heated to an intense temperature and ignite everything within its blast radius. The charred remains of the automobiles in the parking lot indicated that this was probably the weapon used at the Clinical Center. Djakovica was another site that served as a testing ground for the CBU-97, where it proved a rousing success, killing 73 civilians and dismembering and incinerating most of them beyond recognition. Survivors of that attack scattered and sought cover in nearby homes. 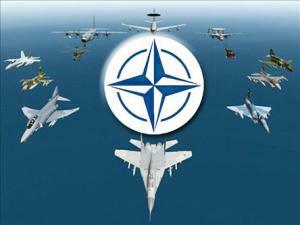 NATO pilots, spotting this, launched missiles on the houses, adding to the death toll. Office building of So Produkt, a distributor of salt products. Photo: Gregory Elich. The state-owned DIN cigarette factory in Nish was one of Yugoslavia’s largest manufacturing facilities, employing 2,500 workers. It was bombed on four occasions. The factory’s deputy managing director, Milovoje Apostolovich, told us that cluster bombs were among the munitions dropped on DIN. Workers found two cluster bomb fragments with messages scrawled on them: “Do you still want to be Serbs?” and “Run faster.” Apostolovich estimated damage to his factory at $35 million. A cigarette factory clearly lacked military utility. The only reason DIN was attacked was because it was the largest employer in Nish. We strolled through the factory’s grounds. A cruise missile had completely flattened the tobacco storehouse. Two of the larger buildings were substantially demolished. Merely to clear away the rubble would be an imposing task. Many of the smaller buildings had also sustained substantial damage. Bricklayers were busily rebuilding the canteen. Across the lane, the façade of the large financial and computer center bore the marks of a cluster bomb, with hundreds of gouged holes spread across its face. Several requests were filed by various parties with the International Criminal Tribunal for the Former Yugoslavia (ICTY) to investigate NATO war crimes, including the cluster bombing of Nish. Established at the behest of the United States, from which it received the bulk of its funding, the ICTY was not an entirely disinterested party. Compelled to deflect persistent complaints about NATO actions, the ICTY Prosecutor’s Office formed a committee it authorized to conduct an “investigation” to determine if there was a basis for legal action against NATO. Bridge over the Nishava River. Photo: Gregory Elich. Try telling Ljiljana Spasich’s widowed husband that his wife and unborn baby were legitimate military targets.